Shadow Uchiha heads north to the Lake. He heads for the part farthest from town. He jumps from tree to tree and shortly, the lake comes into view. He stays in the trees, making a wide circle. When he is to the other side he falls to the ground satisfied. This is a good place to practice my techniques. He figures. He pulls His Trusted Royal Katana off his back and unwraps it. It's painted in patterns of green and different shades of brown. Meant to hide in trees for surprise attacks, his Blade The Royal Katana was given to him recently. He focuses the bond of Spirit and Body and feels the chakra flow through his body, he enhaces the chakra to his fingers and to his fingertips. Having learned how the useinteract His Royal Katana Perfectly, chakra from his Hands Making it to slash, causing its extremities to twitch and become electrified. He attemts to make the Royal Katana to stun, only for it to topple forward, Shadow Uchiha falling to his knees. I know it's draining, but I have got to do it!! He says to himself, his Hands glowing this time. His teeth bared, his hands thrust forward, From His Both Hands contacting The Royal Katana, its eyes hum then glow a faint yellow. Shadow Uchiha stands, his Royal Katana shakily taking its Fast as well. He manages a slight grin, his body shaking and sweat dripping to the ground. This... Is really...hard... He thinks to himself. He attempts to do A Combo With his Royal Katana. Not daring try any of it's chakra-sucking offensive attack quite yet. He makes the Royal Katana a few Slashes off the ground, then jumping with all its might. It soars into the sky, farther than he can, Shadow Uchiha notes. He then takes it easy, trying for some slow punches, gaining speed, testing the limits of the Royal Katana. I guess the biggest hinderance to this battle style is... me? Shadow Uchiha thinks to himself, before falling face-first, his Royal Katana collapsing like a marionette, as it were. His vision fades as dirt is blown from his exasperated breaths. Perhaps a bit much for my first time. But I did it... I did it... I did it... I can do it... He deduces, his arm coming up to support him. "I'm at my limit... Now?.. Using The Royal Katana for three minutes drained me? And that's with no attacks. If I do use him... I need to finish it right then..." He says, his eyes closing. He sits up, tired. He collects his Royal Katana put in his back and Heads to his dorm and takes a short nap and eats. He heads to the mountain to train further. He runs to the mountain, stopping eat along the way, feeling his chakra slowly return.. Shadow Uchiha takes his Royal Katana from his back. He unsheathes his sword and closes his eyes, slashing an invisible enemy. His slashes are quick and controlled. His precision could be better, but his eyes would make up the slack when open. He thrusts forward, his stance widening. He draws back his sword parallel with his leg and runs forward, tip barely above ground. He takes three steps and swings, a technique with enough force to disarm most opponents. His sword finds it sheath and he does a handstand. Legs vertical, he starts doing push-ups. "One, Two, Three...."
"Two Hundred forty-five, two hundred forty-six..." He counts, the sun in the sky beating on him, his fighting gi dripping wet. His face is red, blood having collected. "Might have a stroke or something. That'd get me out of training." He jokes to himself, his shoulders wavering. He continues to push himself. "Two hundred seventy!" Chakra is the energy between mind and body. My mind isn't exactly great, so I must perfect my body! I will be the strongest... I have to. Three hundred!" He falls to the ground, his arms aching warmly. He stands up and looks to the waters edge. he walks to the water and bends down, looking at his reflection. He stands erect and takes a step into the water. His foot stops on the surface, his condensed chakra exerting enough force to prevent his body from sinking. "Easier than the art of tree-walking." He says as his other foot steps on the waters surface, distributing his weight. He changes his chakra distribution, trying to prevent and sideways slips while maintaining lift off the waters surface. The water under him bursts, knocking him off balance, face-first into the shallow water. He raises his head, sputtering water. "Why can't I do it?" he says, frustrated. "It's basic stuff!" He says, going to shore, having been cleaned of sweat and dirt. He performs a series of hand-signs. "Bunshin no Jutsu!" He yells, Three clones appearing. One has no sword, Shadow Uchiha notes, being sure to make sure he focuses on creating the right image in his mind. The bunshin disappear. Shadow's hands once again meet in familiar arrangements. "Bunshin no Jutsu!" He yells, four clones appearing, one falling face-first to the ground, dissappearing. Shadow Uchiha falls to his knee himself. "That must be the extent of my chakra after doing all those exercises.." He spits on the ground and gets to his feet, panting. "Pathetic!" He yells, punching the nearest tree, a single leaf falling to the ground. He collects his Royal Katana and makes the slow trip back to his bed at the dorm. 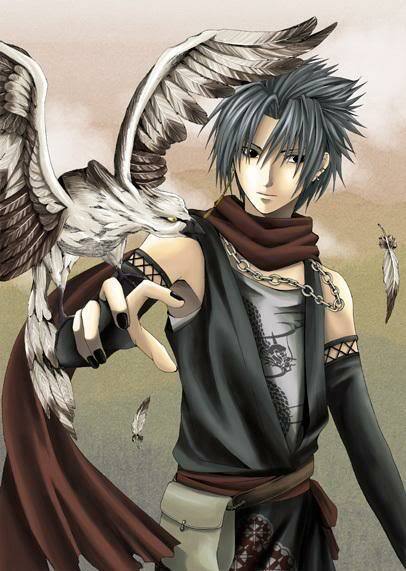 After a meal and necessary errands, Shadow Uchiha makes his way back to the lake for his second stage of training. He throws his Royal Katana into the air, his chakra extending from his Hands, connecting with his Royal Katana. The bands around The Royal katana explode in shreds, a front-flip and it lands on its feet. Shadow Uchiha grins, the Royal Katana hanging limp as it turns and rushes at Shadow Uchiha. Both his hands used to control the puppet, it striked him in the stomach, making him double over. "Maintain... Concentration!!" He yells to himself, teaching himself to block out pain and to control his Royal Katana in actual battle situations. He rolls backward, the Royal Katana raising, two holes in it's palm. Lightning Chakra are ejected, flitting through the air, hitting a tree next to Shadow Uchiha. "My perception was off because I was firing toward myself. I must correct." He says, his strings lose cohesion and the Royal Katana falls to the ground rag doll style. Shadow Uchiha falls to a knee, sweat beading from his face. "Why can't I maintain it any longer than that, it's pathetic!" He says to himself, frustration in his voice.He Walks Back to The Village Thinking of Something.